If you like Sugar Cookies, you are in for a tasty treat. Add some Lavender and amaze your family and friends. NOTE: Do not preheat your oven at this time, the cookie dough needs to be chilled for 4 to 5 hours or overnight. Mix flour, baking powder, salt and lavender, then set aside. Add dry ingredients and buttermilk alternatively to creamed mixture. Chill lavender cookie dough for 4 to 5 hours. Lightly flour your work surface. Not enough flour will make them stick and too much will make them hard to roll out and make them tough. Sprinkle the top of the dough with lavender sugar so the rolling pin will not stick. Bake on a greased cookie sheet at 350 degrees for about 10 minutes or until lightly brown. 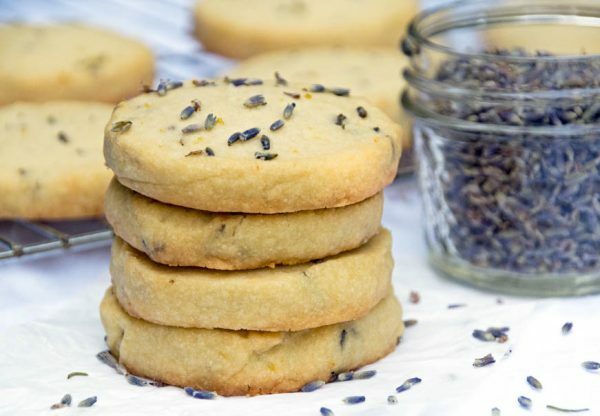 Add 1 tablespoon of lavender buds to 2 cups of sugar. Place in an airtight glass jar, stir or shake to mix, keep for a couple of days. The sugar will pick up lavender scent and flavor. This keeps very well.